Hundreds and hundreds and hundreds of free movies, all available to stream. 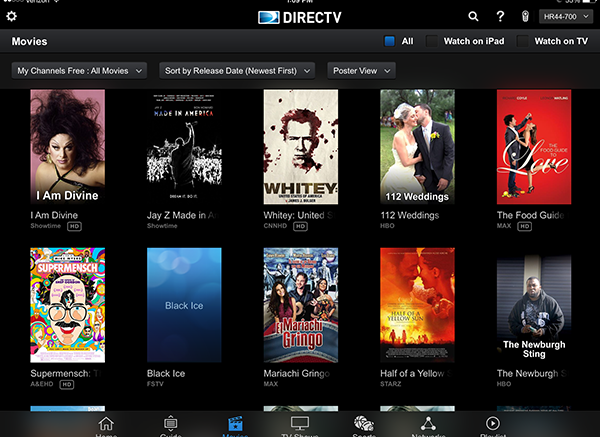 DIRECTV brings them to you on their app for smartphones and tablets, and it’s easier than ever to get them! The latest version gives you a revised user interface with the ability to filter out FREE content! It’s even smart enough to know if you have premium packages and show you that content if it’s available. Just use the dropdown menu at the upper left to show My Channels Only and Free Items Only. You can even go further, filtering by genre too. You’ll get full guide data, cast information everything. If you want to look at free movies to record, choose “All” from the upper right choices. If you only want to look at streaming choices, choose “Watch on iPad,” “Watch on Phone” or “Watch on Tablet” depending on your device. It’s super easy. and you get near HD resolution if your device has enough bandwidth to support it. Even use your device’s built-in “casting” ability (Miracast, Chromecast, AirPlay, etc) or a good-old-fashioned HDMI cable to put the content up on a TV. As I said, who needs Netflix? The best part, of course, is that all of this is free with your DIRECTV subscription. Of course, if you want pay-per-view movies, you’ll get a full selection and ordering is easy, it just charges to your DIRECTV bill! There are tons of movies available weeks or even months before the premium channels or Netflix get them, plus a complete library of back titles. Of course, it’s not just movies either. There’s a lot of on demand content, and with a GenieGO you can stream or download content from your home DVR as well. Virtually unlimited!